Added sugars! While the American Heart Association recommends limiting added sugars to 6 tsp/day for women and 9 tsp/day for men, there was no way to know how much you were getting because added sugars weren’t required to be on labels. Fiber gets redefined: If approved, the “fiber” on a label will reflect only the the intact, unprocessed fiber in whole foods, and exclude purified fibers such as maltodextrin and inulin (which are added to processed foods). Vitamin D and potassium: Requiring these two nutrients (in place of Vitamins A & C) is much more relevant to the health needs of today’s population. No more serving size trickery. Have you ever been able to get 4 servings out of a pint of Ben and Jerry’s? I didn’t think so. On the new label, serving sizes for many foods have been updated to reflect more realistic (in other words, larger) portion sizes. And most importantly, it’s easier to read! With this new design, your eyes are drawn towards the important information. The calorie count jumps out at you and the % Daily Value of Nutrients is much easier to trace. These proposals are scheduled for publication in the Federal Register on March 3. After that, the FDA will collect comments for 90 days. To read the reports detailing the proposed rules and changes, see this FDA webpage. First Lady Michelle Obama has been instrumental in getting this legislation approved, and in record time! This is basically the food industry’s worst nightmare, so expect a carefully strategized counterattack during the comment period. Score one for public health and food policy! More big news in food policy: FDA proposes new and MUCH improved food label laws, bringing current science and clarity to consumers. 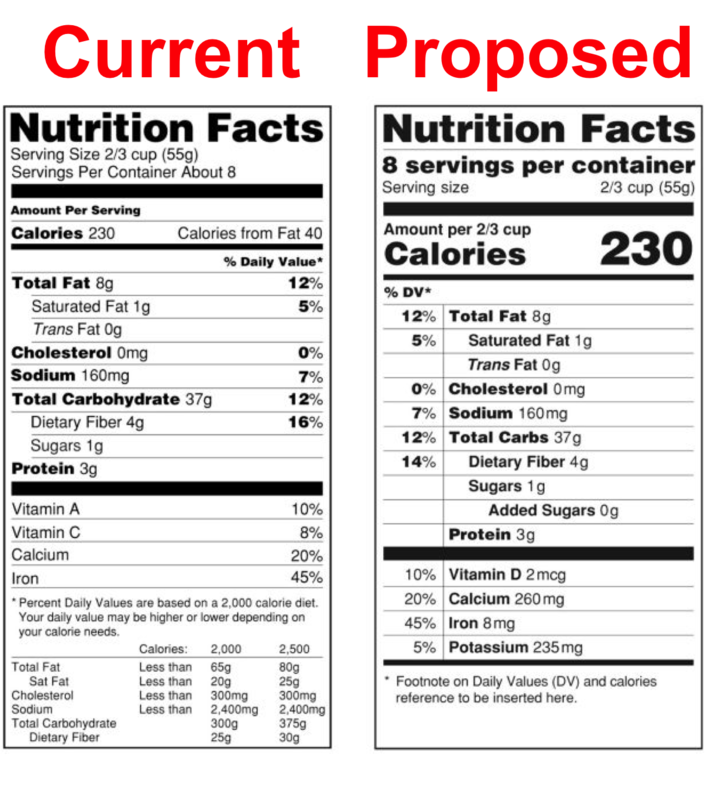 Registered Dietician Kelly Toups provides helpful insight into why both of the FDA label suggestions would be a major boon to consumer awareness. The FDA will be collecting comments on their proposed label designs for the next 90 days. Now is your chance to weigh in! I definitely like most things on the new label. However, the new serving size hasn’t completely sold me. I like that it will more accurately reflect the eaten serving size, since many people only look at calories and don’t realize it can be double or triple. BUT, I also have many people who “stick to the serving size” and they mean the serving size listed on the label. This may give some people an excuse to overeat. Another opportunity to EDUCATE!!! Thank you! Labels are so tricky. I went to a panel on food labeling over a year ago and different experts shared what their ideal food label looked like. It was really interesting! Hello! I am researching this topic right now and I wondered it you had an update (since this was almost 2 years ago)? I did hear something recently about the FDA finally updating the labeling standards. Is the above what they are approving?